Today we are going to discuss about (CTR) Click through Rate and no doubt in that this is one of the best way to earn additional income for long life. But for that you should have knowledge about those all secrets which can increase your CTR. On other hand if you are a professional blogger then you can get numbers of benefits from this in less time. Everyone could not take advantages from this because as we all know this era of online marketing is full with competition. Along-with that Google is going also smart day by day, So these why when you will show your smartness in your blog then you will get smart return from blog. 1. Now the thing is that how to increase CTR: For that first of all you will need to take AdSense approval from google for your site. Click through rate(CTR) and (CPC) Cost Per Click are the two biggest factors that define the earn amount of AdSense publisher. You cannot control on CPC, So if you are not getting enough CPC then not an issue you should live with it. Bloggers are always trying to find out new useful ways of increase AdSense CTR rate for their blogs and websites. 2. Some Useful ways to increase AdSense CTR: It’s such a not difficult task to do but on other hand it’s not an easy task to do as well if you will not have strategy for this. Now I am going to sharing my own thoughts by which I got healthier CTR for website and blog. 3. Ads Placement Area: This is very first step to increase CTR and your AdSense ad should be on that kind of place where ads gets more eyeballs and therefore more CTR. The recommended area for ad is above the fold. 4. Ad Size: Often we are not notice this kind of things about the size of ad but actually these kinds of things have their own importance, So you should try to choose that kind of size for your ad where it look naturally and it could be fit easily in layout of your blog or website. 5. Impact of Ad Blindness: If you are already get good numbers of regular readers then you should notice ad blindness factor more carefully. Those readers who are come back on regularly basis on your blog for read only content because they have much expectations from you to know more about that particular field in which they want. So you should try to avoid changes in layouts of your blog or website because they will not give much importance to ad which is running on your website or blog. 6. Quality Content and Niche: If your site or blog is about particular niche then there are more bright chances to increase your CTR for you. Google AdSense has contextual ad policy. Google is also serving those kinds of ads as well which are related with the content of your website or blog. Quality of content is the most important part of your website’s success. Better quality of content will give you more traffic on your website for longer time periods. And there will be more chances of higher Click Through Rate. 7. Value of Organic Traffic: You should notice one thing right now if your website traffic is not coming from search engine then there is going something wrong. From my opinion at least between 65-70% of your overall traffic should be organic. Because there are more chances click on ads by those who are coming from search engine traffic because they want right information on anyhow. How much should be CTR (Click Through Rate)? If you are getting click through rate above 2% then you should be happy with that. But if it is coming below 2% then you should consider other useful ways to increase AdSense CTR before than too late. Beside that there are some those kinds of bloggers who are claim yes we are getting CTR more than 20% but this is totally lie. 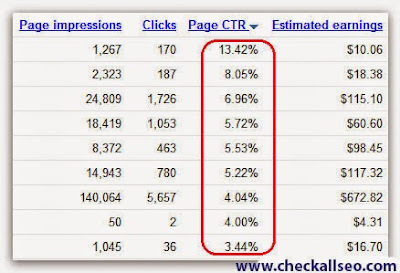 Google has set some parameters for it like if someone is getting CTR above 5% then google will take notice of such higher Click Through Rate and they will look deeply into your blog. If you are violating AdSense policies then it could be prove harmful for you and your adsense account could be blocked forever. Interesting tips, Sanjay.. It's also worthwhile to look into solutions with implemented Rich Snippets. Your products will stand out that much more in Google search results if they're garnished with a photo and star rating. Google itself states: “On average, ads with Seller Ratings get a 17% higher CTR than the same ads without ratings". Some independent review collecting companies, like eKomi, offer Google-integrated reviews through their partnership with the search engine giant. Added pictures and star ratings are reported to increase the CTR by up to 20%. Each opinion written by a client contains unique wording and style. Search engines see that and prioritize your websites over other outlets. That way you get instantaneous feedback on your product and also free SEO benefits. Thanks, Jacob and welcome to your valuable suggestion. increase click through rate by give your site better visibility on free classified by Advertise your business freely by post free advertisement on megasasta.com or write free blogs on megasasta.com to get better exposure through searches on search engine.